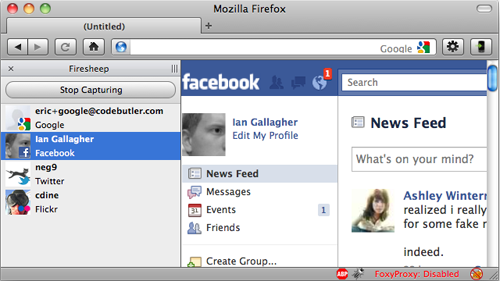 A Firefox add-on that allows you to gain access to social media accounts of people in your wifi network. It comes with a super-easy user interface, and works for every service that’s not using a secure https connection. It’s “stealing” cookie-sessions in the Network, which grant access to anything not using the https protokoll. The project reminds me of 2 of my favorite art projects – “Men in grey” and “Pirates of the Amazon“. This security problem is common knowledge to “us” geeks, but bundeling the technical knowledge with such an easy interface, so everyone can understand and (hopefully not) exploit it… Brilliant. It’s a scary thing, and it surely makes you think twice before loggin-in to your facebook account in a public WiFi – ALWAYS USE “https://” and you’ll be ok. Btw I just remember how some Hax0r kiddies at the 25C3 exploited a flaw on my hacked iPhone, which cost me 100€. Use your force wisely, Padawans! Exploiting [stupid politician]‘s twitter account – maybe funny. Messin-up the accounts of fellows – NOT.